If there is one artist who knows how to master the detailed finesse of his performances and his interaction with the audience, then it is most certainly Johan Gielen. His unique way of handling his live sets, proves of true showmanship that begins when he takes the stage to the choice of his music and his sublime mixing skills. 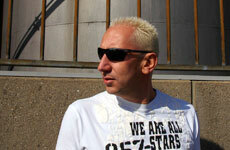 Few DJs can lean on the status of Superstar DJ; Johan Gielen belongs to this elite. Johan Gielen begins his walk of life at seventeen at the El Sombrero discotheque in Reusel. Not long after that period he leaves for Japan for two years to work as resident DJ at club Velfarre in Tokyo. Johan’s reputation runs ahead of him and after his return to The Netherlands his career skyrockets, both nationally and internationally. From all over the world the booking requests pour in and in no time he plays the biggest venues of the world, features on the known raves and appears in every line-up of the ruling festivals and clubs like Dance Valley, Sensation White, Sunrise Festival, The Government, Space, Godskitchen and many more. Up to this day Johan Gielen remains the only artist who performed 15 times in succession at the prestigious Trance Energy. In 2000 Johan starts producing with Svenson. The duo harvests worldwide hit records and strikes gold with titles like “The Beauty of Silence” en “Twisted”. By that time the amount of remix assignments for artists like, amongst others, Tiësto, Boy George, The Thrillseekers, Chicane and Delirium, has gone through the roof. Countless Top10 positions follow, all with global success and especially in Germany, Austria, France, Switzerland, U.K. and his land of birth Belgium. Johan’s Productions receive support from all the major DJs and are played everywhere. After a few years of hard work both Svenson and Gielen each decide to go their own way and Johan continues with his own productions and worldwide performances. Johan builds up an ever growing flock of fans, naming him one of the Ambassadors of Dance. The artist Johan Gielen by now has already made it perfectly clear that he is not just ‘that guy playing records’, but above all a professional performer who loves to experiment with new initiatives during dance evenings. By the end of 2003 he jumps from the fiftieth position to the 24th in the annual DJ Top 100 from DJ Magazine. During the eighth edition of the Rotterdam Fast Forward Dance Parade of 2004 he hosts his own truck while promoting “Johan Gielen For You”: his then upcoming world tour. He performs during Strike One, The Arrival, an enormous dance event in the Kuip stadium in Rotterdam and 2005 is the year in which Johan attends the Amsterdam Dance Event and also plays the fifth edition of Frequence Outdoor on the E3 beach in Eersel. In 2006 Johan further expands his busy activities with the launch of his debut album “Revelations”, which is released by Black Hole Recordings. With this release he brings his fans not just trance, but also progressive and techno. A mix of styles which he later on that year puts to practice at Trance Energy in Utrecht during the very first live performance in his career. From that moment on it is clear for everybody that Johan Gielen can no longer be seen as merely a Trance DJ, but also as an artist who knows how to make the perfect combination of house, electro and trance in a style that he obviously adapts to his audience. Enter 2009 and Johan tirelessly continues the up going line in his career. He mixed the very first edition of the “Private Party” mix compilation for Black Hole; under the alias of Airscape he released the single “My Love” with the vocals of Jes Brieden and he began a brand new project with Virtual Vault, named The Dubguru. Their first single “U Got To Know” immediately shot to the highest regions of the charts. And as if it isn’t enough yet, Johan currently works hard for the release of his upcoming artist album, featuring several collaborations with befriended class-A artists. The productions show that over the years Johan has widened his view and that he doesn’t limit himself to trance, embracing other styles as well. Online Johan is also a busy man and hosts his own monthly radio show and podcast, called “Global Sessions”. The show is broadcast by various stations all over the world. And it’s exactly this global character that defines Johan Gielen’s career. Indeed The Netherlands is his home base, but the world is definitely his working place. Or, as Johan likes to put it: “The world in which I move around every single day, can be read by the stamps that I have all over my passport. With such an enormous amount of airmiles I can fly around the world for free six time over!” (Laughs). Johan Gielen continues to expand his ever growing portfolio of productions and performances; 2009/2010 will be an era full of surprises!